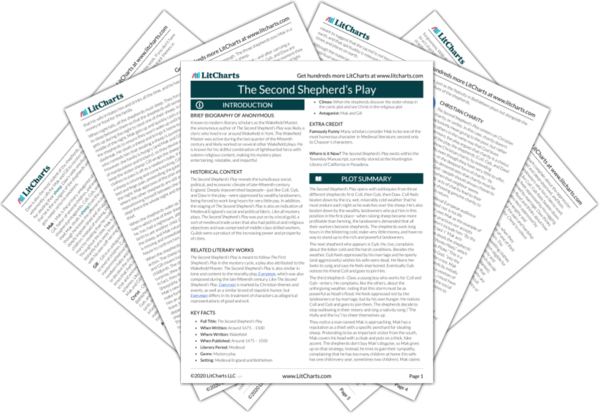 Instant downloads of all 946 LitChart PDFs (including The Second Shepherd’s Play). Welcome to the LitCharts study guide on Anonymous's The Second Shepherd’s Play. Created by the original team behind SparkNotes, LitCharts are the world's best literature guides. A concise biography of Anonymous plus historical and literary context for The Second Shepherd’s Play. A quick-reference summary: The Second Shepherd’s Play on a single page. In-depth summary and analysis of every scene of The Second Shepherd’s Play. Visual theme-tracking, too. Explanations, analysis, and visualizations of The Second Shepherd’s Play's themes. The Second Shepherd’s Play's important quotes, sortable by theme, character, or scene. Description, analysis, and timelines for The Second Shepherd’s Play's characters. Explanations of The Second Shepherd’s Play's symbols, and tracking of where they appear. An interactive data visualization of The Second Shepherd’s Play's plot and themes. Known to modern literary scholars as the Wakefield Master, the anonymous author of The Second Shepherd’s Play was likely a cleric who lived in or around Wakefield in York. The Wakefield Master was active during the last quarter of the fifteenth century and likely worked on several other Wakefield plays. He is known for his skillful combination of lighthearted farce with solemn religious content, making his mystery plays entertaining, relatable, and impactful. 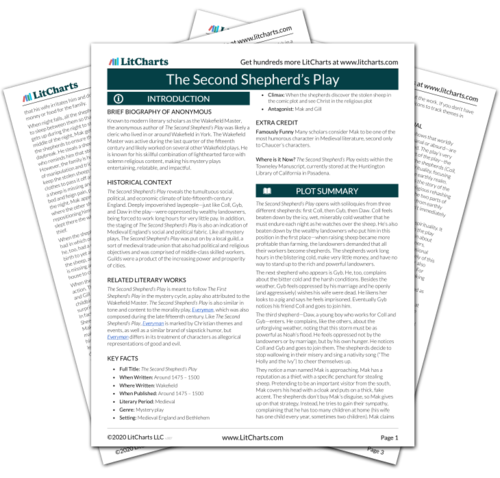 Get the entire The Second Shepherd’s Play LitChart as a printable PDF. The Second Shepherd’s Play reveals the tumultuous social, political, and economic climate of late-fifteenth-century England. Deeply impoverished laypeople—just like Coll, Gyb, and Daw in the play—were oppressed by wealthy landowners, being forced to work long hours for very little pay. In addition, the staging of The Second Shepherd’s Play is also an indication of Medieval England’s social and political fabric. Like all mystery plays, The Second Shepherd’s Play was put on by a local guild, a sort of medieval trade union that also had political and religious objectives and was comprised of middle-class skilled workers. Guilds were a product of the increasing power and prosperity of cities. The Second Shepherd’s Play is meant to follow The First Shepherd’s Play in the mystery cycle, a play also attributed to the Wakefield Master. The Second Shepherd’s Play is also similar in tone and content to the morality play, Everyman, which was also composed during the late fifteenth century. Like The Second Shepherd’s Play, Everyman is marked by Christian themes and events, as well as a similar brand of slapstick humor, but Everyman differs in its treatment of characters as allegorical representations of good and evil. Famously Funny Many scholars consider Mak to be one of the most humorous character in Medieval literature, second only to Chaucer’s characters. Where is it Now? The Second Shepherd’s Play exists within the Towneley Manuscript, currently stored at the Huntington Library of California in Pasadena. Weeks, Rachel. "The Second Shepherd’s Play." LitCharts. LitCharts LLC, 19 Jan 2018. Web. 24 Apr 2019. Weeks, Rachel. "The Second Shepherd’s Play." LitCharts LLC, January 19, 2018. Retrieved April 24, 2019. https://www.litcharts.com/lit/the-second-shepherd-s-play.